Old status quo politicians-- I usually refer to them as careerists-- feel very threatened when Democratic constituencies elect younger non-establishment representatives. That's the dynamic we've been witnessing with the calumny heaped on AOC and the refusal by most Democrats to ever try to understand what she's trying to accomplish with the Green New Deal and why raising the margin tax rate from annual income over $10 million (an extremely modest proposal). 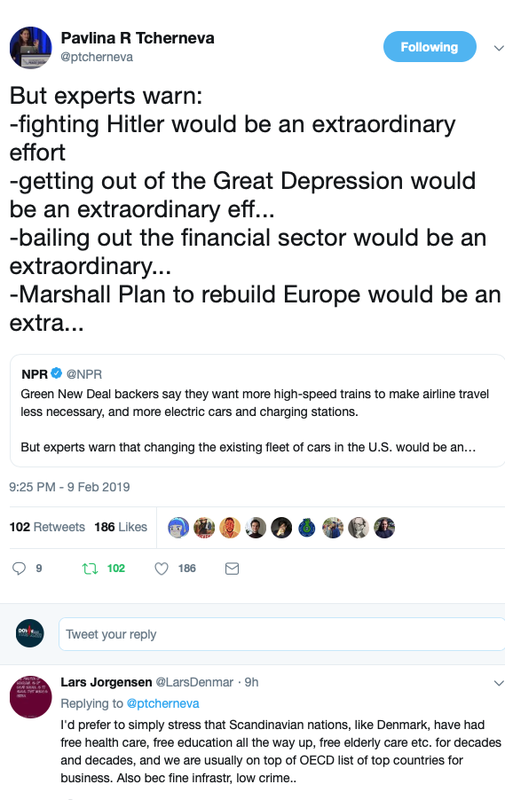 On Friday, NPR's Jeff Brady reported that despite few details and much doubt, the Green New Deal generates enthusiasm... among people, not among lobbyists the donor class and politicians. "All great American programs, everything from The Great Society to The New Deal, started with a vision for our future," said co-sponsor Rep. Alexandria Ocasio-Cortez (D-NY). Change is always hard. Big change takes extraordinary efforts. And extraordinary leaders, rather than careerist politicians of the status quo. And AOC and her ideas aren't the only targets for establishment pols. Pelosi appointed AIPAC's chief lobbyist in Congress, New Dem Eliot Engel, to head the House Foreign Affairs Committee. He's from the other side of the Bronx from Ocasio Cortez-- rich, white, Jewish Riverdale. 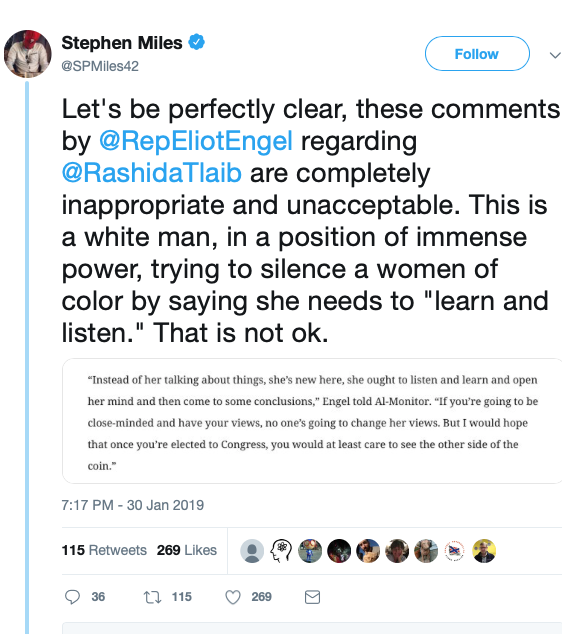 And he filled his lid when Rashida Tlaib started making waves about Israel. She announced she's not going on the AIPAC-sponsored trip to Israel that every freshman is "supposed" to take. Instead she proposed a trip to see what life is like for Palestinians. Smelling salts and fainting couches on both sides of the aisle! Texas dentist Brian Babin (R), a dullard, sent a letter to each Democratic House Committee chair demanding they deny her the right to take such a congressional delegation, insisting it would threaten the U.S. relationship with Israel. Completely mind-boggling from someone who was appointed chairman of the Committee precisely because he is so utterly close-minded! And there are worse assholes than Engel. 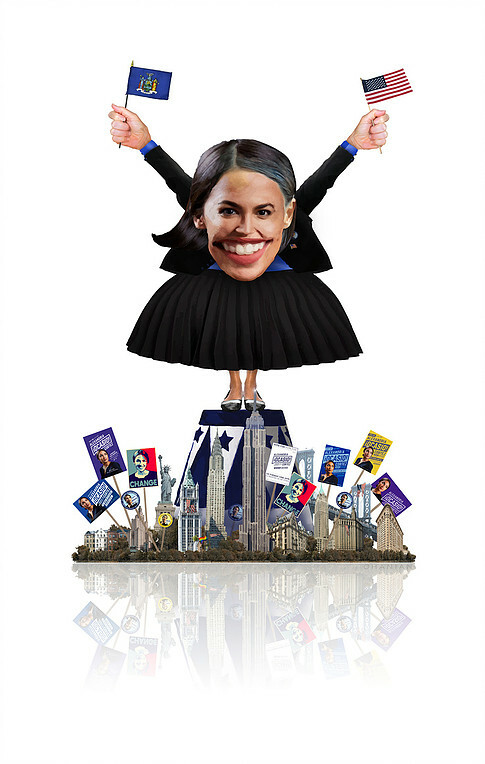 On Sunday, Haaretz reported that Kevin McCarthy is promising to take action against Ilhan Omar and Rashida Tlaib. He's demanding "action" from Pelosi and Hoyer and says if they don't take any, he will. "This cannot sustain itself. It’s unacceptable in this country." He said their questioning of the nature and scope of U.S. relations with Palestine "were equal to King’s and more so." There is no member of Congress and no district safe from the wrath of AIPAC. Earl Hilliard served in the Alabama state legislature from 1975 through 1992 when he was elected to serve as the member of Congress from the gerrymandered district that managed to twist and turn all over the state to encompass as many back areas as possible, from the black neighborhoods of Birmingham to the back neighborhoods of Montgomery to Tuscaloosa and the Black Belt rural counties of middle Alabama. No Republican and no white politicians was ever going to offer Hilliard an obstacle to reelection. But in 2001 Hilliard voted against a bill funding military support increases for Israel and opposing criminalization of Palestinian politicians. AIPAC set out to destroy him with the use of a conservative black corporate whore and AIPAC pawn, Artur Davis, who, by the way, later switched parties and became a Republican. It isn't the first time Israel has interfered directly in American elections through AIPAC. 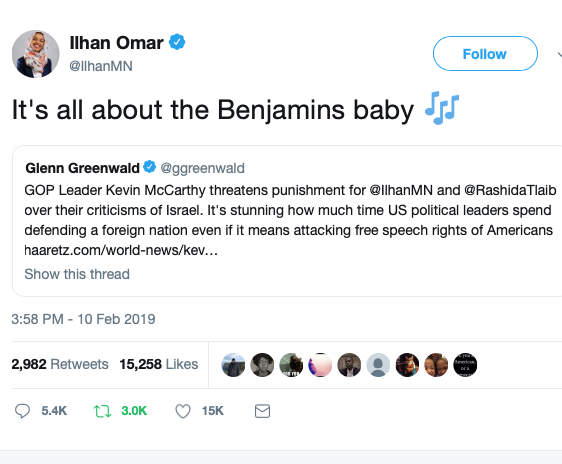 And now they're after Ilhan Omar and Rashida Tlaib. Today, scummy Blue Dog Max Rose and Chelsea Clinton, as well as Liz Cheney, came down on the side of AIPAC against Ilhan, of course. 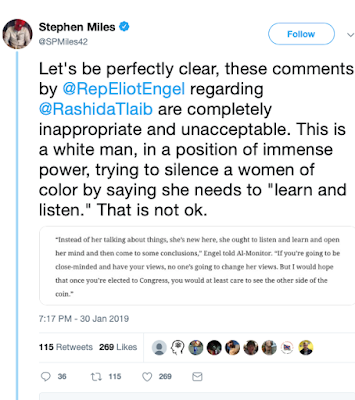 Other right-wing New Dems like Seth Moulton (MA), Josh Gottheimer (NJ) and Elaine Luria (VA) have jumped on the bandwagon as well, hoping to be rewarded by AIPAC for their efforts against their colleague. Just disgusting. 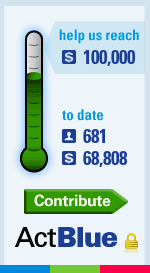 If you'd like to contribute to Ilhan's reelection efforts, the thermometer on the right goes to an ActBlue page for incumbents doing an especially good job. Naturally that didn't satisfy the Republicans, not when they smell blood in the water and sense an opportunity to drive a wedge been the AIPAC-loving Democratic establishment and the Democratic grassroots that generally abhors AIPAC and other lobbyists trying to dictate American policy. After Pelosi's surrender, the NRCC immediately released their own statement: "It’s time for Angie Craig, Dean Phillips and Collin Peterson to take a stand against anti-Semitism and bigotry by calling for Ilhan Omar’s immediate removal from the House Foreign Affairs Committee." I wonder if Pelosi will cave on this too. 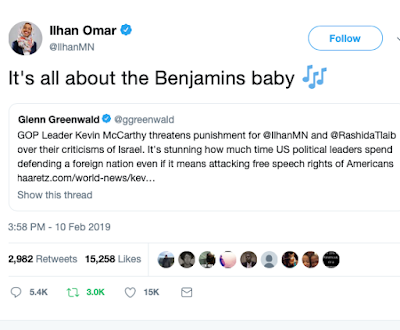 No, she shouldn’t apologize for calling out AIPAC. But I gasped when I read her tweet. At a minimum it was an unforced error. Attacking Israel can derail and marginalize the left. It is one thing to ask that the Palestinians be treated humanely and argue for a just solution as Bernie does. It's another thing to attack Israel. It might make the left feel good but it is a losing strategy. The issues that the left can win on are issues that help the majority of Americans like Medicare for All, a livable wage, a Green New Deal if it is explained well, free college, etc. 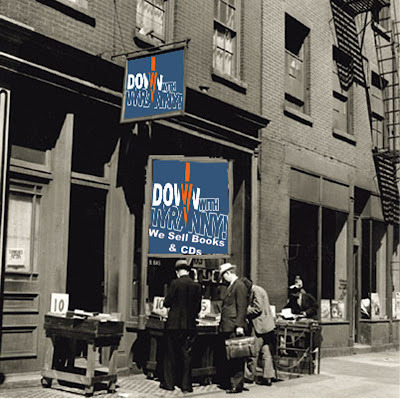 "All great American programs, everything from The Great Society to The New Deal, started with a vision for our future,"
um... not really. They started with decades of systemic abuse of vast demographics followed by a seminal threat of overthrow of the capitalist apple cart by the masses. The Great Society would never have happened if the threat of a race war (anyone remember the Watts riots... Detroit... all of MLK's marches and protests??) was not palpable. 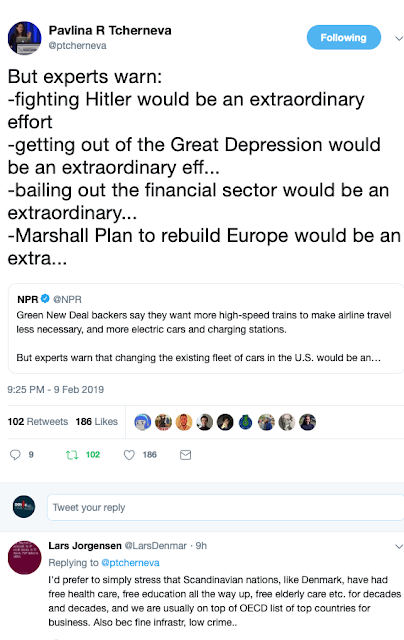 The New Deal could never have happened were it not for the Great Depression... the first greatest wall street greedgasm that devoured the American poor and middle... and the threat of the masses adopting a communist/socialist alternative to capitalist greed. But these also occurred when americans were smarter and had courage to act. Can ANY seminal change occur in today's America... where voters are so stupid as to be cajoled into electing and re-electing total frauds like obamanation or... trump? does anyone remember the Carter admin? I do. This GND is Carter's energy policy resurrected and includes the science advancements since 1977. What did we do then? We elected the first openly fascist (and addled) president on a platform of mushrooming the federal debt to give money to millionaires. what will we do in 2020? maybe we'll create our first few trillionaires among our plutocracy/oligarchy/aristocracy. I can see 125 million 'trillionaires in waiting' all voting for this very thing... can't you? Big oil/coal/gas will gladly spend a trillion dollars to make sure this never happens. America is where great ideas go to die. All of this is part of the corporatist assault on progressives. Unfortunately, it looks like they scored a hit this time.